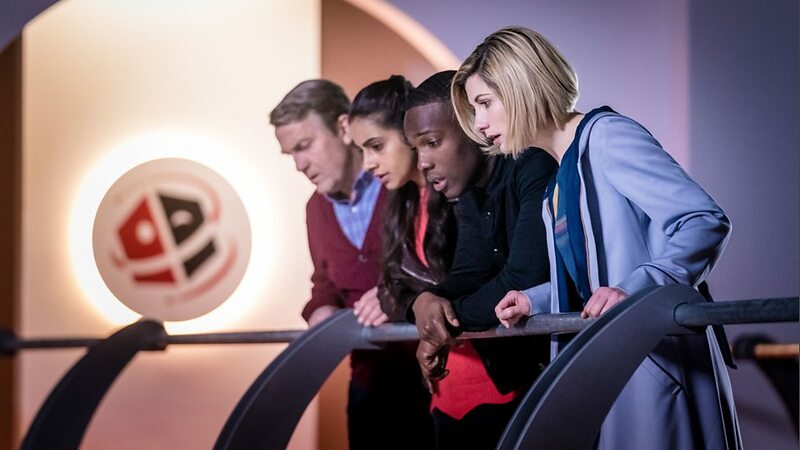 After five episodes of this new Doctor that were often heavily freighted with political overtones, moral messages and Social Justice Warrior battles, it was extremely refreshing to get episode 6, Kerblam, that had almost nothing political about it at all. Except it did. The political bit got snuck in during the last maybe 5 minutes, and provided a glorious reversal that I hadn’t seen coming. Also – despite it being set in the future – it echoed the historical appeal of Luddism beautifully. Plus it mocked/tore up/tipped its hat at Amazon. I enjoyed it very much. The episode opens with our crew zipping through turbulence in the Tardis timestream, bouncing around and getting panicky until the turbulence resolves as something homing in on them. It’s a robot delivery droid from Kerblam – the galaxy’s biggest retailer (Amazon) – teleporting in with a delivery for the Doctor. A Tommy Cooper hat. Naturally the Doctor wears it. But the hat is not the thing – the message on the packing receipt is the thing. So our troupe dash to a moon which Kerblam has colonized as a storage fulfilment center. Vast, dystopian warehouses recede into the distance. Robots with terrifying smiles and uniforms like something out of the Third Reich predominate. The workforce is 10% ‘organics’ (human) as mandated by some new tokenistic political reform. Most people are unemployed. Workers who make it to the warehouse live there with only 2 weekends a year spent at home. Comedian Lee Mack is one of them – he gets to crack a joke or two. The Doctor et al go undercover trying to figure out what the issue is, and who needs help. With a workforce of 10,000, how long could it take? I loved the set-up of this episode. Vilifying Amazon in this way, or at least setting it up to look like companies such as Amazon are the enemy, was fun in itself. The creepy bots. The massive, Gilliam-esque sets of warehouse machinery stretching to a vanishing point were extremely well done. A conveyor belt scene paid homage to a similar scene in another movie (was it Star Wars?). The feeling of little humans getting chewed up by an enormous, uncaring, impersonal machine was most evocative. The denouement of this episode was both brilliant, daring and shocking. No, it wasn’t the system breaking people. It was the system calling for help. A terrorist guy in the workforce has been stealing delivery robots and setting them up with explosive plastic bubble wrap. They’ll all go out at once, the recipients of the bubble wrap will die, and a lesson about how humans are treated by Kerblam will have to be learned. What an enormous amount is packed in there. First off, the idea of explosive bubble wrap is genius – and right before Christmas! Doctor Who has always excelled at finding terror in non-terrifying, even banal things. Shop mannequins. Weeping angels (already a bit scary, to be fair). Now bubble wrap. What kid, after watching this episode, won’t be at least little bit careful when popping bubbles on Christmas Day? Secondly, the inclusion of another human baddie. I love this. Humans are bad pretty often. Digging into what terrorism is and what it means has a lot of value. The show is brave in giving the terrorist in this case a very real and legitimate wrong he’s trying to right. Humans in this future are getting abused and neglected. The answer is obviously not to kill people – but it’s a symptom of how hopeless things had become that this young guy things this approach is the answer. Thirdly, the Doctor’s response is beautifully subtle. It’s not the system. Basically she is saying – there is no such thing as computer error. Only human error. The system is wrong because we made it wrong. Which means we can make it right again, and should. This is topical today in that so many of society’s ills are getting blamed on automation, and if they’re not blamed on automation, they’re blamed on immigration. We’re in charge of all these systems though. We’re doing this to ourselves, and the system is a tool. Kerblam is not evil. Maybe it’s being used in evil ways. The fact is – people want their shopping delivered to them. That’s not evil. I want that. I shop on Amazon for nearly everything. All my groceries get delivered. ‘Hand-shopping’ seems like a failure of efficiency to me now, if I somehow miss a delivery deadline. In 1810 the Luddites went after weaving frames in a bid to set back the march of technological progress and return jobs to good honest weavers. Market forces prevailed, because they reflected a greater good for what most people wanted. The lesson is the same here. Accept the change, but guard against its effects. I love this as a parable for globalisation, and the turbulent times of nationalism we’re going through. Slow down. Look after the little guy. Share some of the wealth from these wealth-concentrating systems, instead of funnelling it all into the pockets of one almighty tycoon (Bezos).